You’re a master of scheduling your stylists and booking clients, but there’s been more than one accidental occasion when you ran out of products at the salon. Whether you’re running a nail salon desperately in need of new top coats or a hair salon on the hunt for your signature shampoo, there are a few ways you could be structuring your inventory to avoid these issues. Read on to discover the secrets to always staying stocked, and enlist the help of SalonTarget’s software when you’re ready to stay on top of your shelving. Managing the inventory of in-store product is best done on a set schedule, by a specified person. Commit to taking inventory weekly, biweekly, or monthly, whatever suits your salon’s needs, and have the same person check products each time. That way, you have a qualified inventory lead who knows exactly what your salon is and is not stocked with, and they know when to order more material. Once you have your inventory updated, you can also coordinate with your supplier for additional inventory assistance. For instance, when you receive a new shipment of product in, collect paperwork from your supplier that details exactly how much of each item was received and enter it into the system. The best way to get a product off your shelves, is by setting a goal to get it into the hands of customers. Tell your stylists and receptionists the amount of product you’re trying to sell by the end of the month, and offer an incentive to the employee who’s able to sell the most product to clients. Understand that product sitting unused on your shelves is money that’s not benefiting your business. Also set turnaround goals that allow you to get new product in as soon as possible. Also, if you have product that is not getting purchased by customers month after month, set a goal to get the remaining items off your shelf soon, and don’t reorder it. There are several things you need to keep in mind when checking product inventory. Namely, how much of each product is available and how often it’s turning over. Are people interested in buying this product — if so, can you invest in other products that complement it to increase your sales? Be aware of how much product is reasonable for you to have on the shelf at one time, so you’re not tying your money up in items that are just sitting around the salon. Once you know what products and how much of them to keep on the shelves at a time, establish a minimum level for your stock. A minimum level is the amount of product that alerts you when it’s time to reorder more supplies. For example, if you know you typically get through 20 containers of a certain mousse in a month, and you set 5 as your minimum stock level, then you know you need to reorder product when you have 5 mousse bottles left on the shelf so you’re never left without product available. 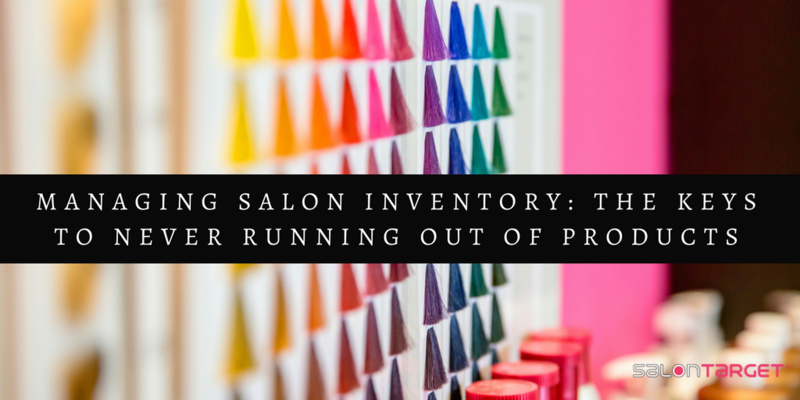 After practicing the process of taking inventory and getting to know the needs of your salon, you feel like you’re pretty much an inventory pro. However, you still need a way to record all your information. SalonTarget’s product dashboard makes it easy to keep track of everything you have in stock. Easily check product information, purchase history, and manage product inventory from your desktop or mobile device. You can also use the products dashboard to search for trends in purchases. For example, do you sell more sea salt hairspray during the summer months when clients are looking to replicate beachy waves? This knowledge will improve your ordering process for next year’s summer season.